If you aren’t sure what kind of fins you should use for diving, we totally get it! There are so many options out there that it can get really confusing. If you’re looking for the best snorkeling fins, have not fear. We researched some of the best-known brands and top-selling products to find the best ones for you. Before we get into our snorkeling fins review, let’s take a look at some of the key features you need to know. Full Foot: Full foot fins fit like a shoe. There’s a foot hole and the fin conforms to your foot to keep you comfy and the fin secure. The other option is a heel strap, which is more adjustable. Adjustable: Speaking of adjustable, a heel strap is only one way you can change the fit of a snorkeling fin. Some have ankle straps that can be tightened, too, so that you can get the perfect fit for your feet. Bag Included: Most of our top picks include some kind of bag. Bags are great, they give you somewhere to store your fins and provide you with an easy way to carry them from place to place. Size: All of these fins are made for adults with one that is also rated for teens. That said, some of these are meant to fit a range of sizes, which is why they have so many options to adjust the fit. Colors: This has absolutely no effect on how well a fin will work for you. But it is really fun to be able to pick what color matches your style and you get a lot of different options here. Now that you know a little more about the features to look for when hunting down an awesome pair of snorkeling fins, let’s look at our best snorkeling gear review. Are you running short on time? No worries. Check out the top 2 items on our list. They’re our top and budget picks and will give you a good idea of the kind of things you should look for. The rest of our list is pretty awesome, too! Okay, let’s go! Our top pick for the best fins for snorkeling is from WildHorn Outfitters. They’re seriously so comfortable. Why? Because they’re designed like a shoe! You’ll be surprised how easy it is for you to walk on land when you’re wearing these fins. They actually slip on like a sock and have a Velcro strap around the ankle to fine-tune the fit and get some additional support. The boot part is made of flexible neoprene with a little bit of stretch to help fit feet of different shapes and sizes. It’s attached to a rubber sole that is surprisingly supportive. They’re heat fused. That means there’s no glue and they’ll hold together longer. 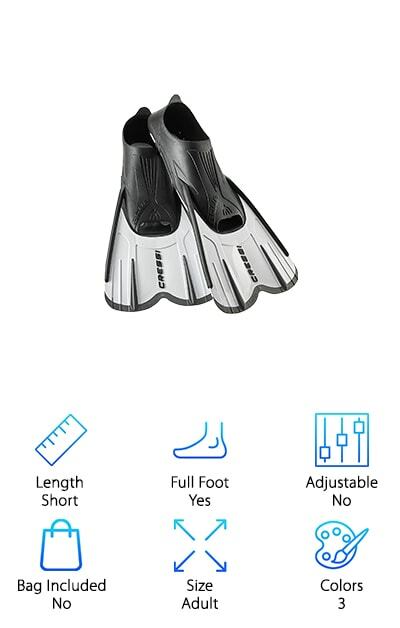 These snorkeling fins really give you a lot of support and protection. They’re short blades that are designed for speed during shorter swims. If you’re looking for the best fins for the money, our budget pick might be just what you’re looking for. This pair from Cressi is a soft, sort blade with a big, comfortable foot pocket that makes them easy to slide in and out of. Each size fin can fit a range of 3 to 4 different shoe sizes. This is largely because of the durable, adjustable foot strap. Plus, you can also wear these over a thin pair of shoes like water socks. They’re available in 4 different sizes and 6 different colors so you’re sure to find a pair that fits your feet and your style. 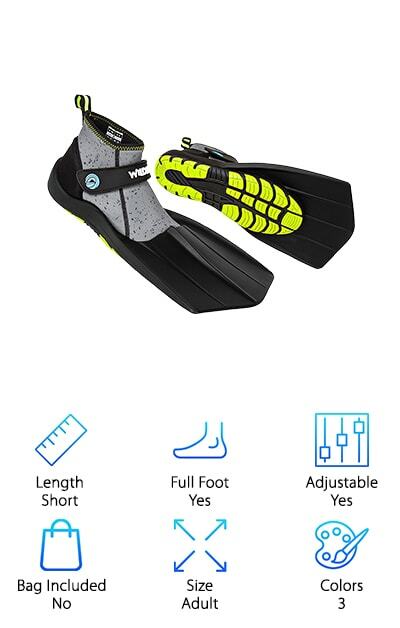 These fins are perfect for the beach or the swimming pool and will give you boost to get a bit more speed out of short swims. This is a great pair of short fins from U.S. 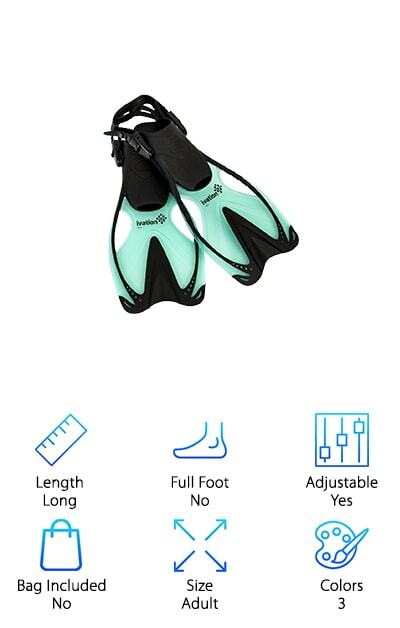 Divers that are super soft and comfortable. The fin is made of both hard plastic and flexible latex. Combined, these materials give great snap and power when you’re in the water. That’s what makes short fins ideal for snorkeling. They help you get around quickly and are best used for short periods of time whereas long fins are better for deep, long dives. So, not only are these fins ideal for snorkeling but they look pretty cool, too. Especially in the 9 different color combinations that are available. Because these are short fins, they’re easy to travel with and even come with a mesh carry bag. The heel strap is easy to adjust so you can make sure you get just the right fit. The Seavenger Snorkeling Swim Fins are some of the best travel fins for snorkeling that we came across in our research. The open-heeled design is really easy to wear. Plus, the material is super soft, lightweight, and really comfortable, even in bare feet. That said, if you want to wear fin socks for some insulation, that’s no problem either. Simply adjust the heel straps so you can them to fit with or without socks. In addition, they have thumb loops so you can easily pull them on and off your feet. The blade responds really well to any swimming style, which makes these a good choice for beginners and experienced snorkelers alike. These a great pair to share with friends and family since they’re so adjustable. That’s not all, they also come in a fast-drying mesh bag, perfect for travel. 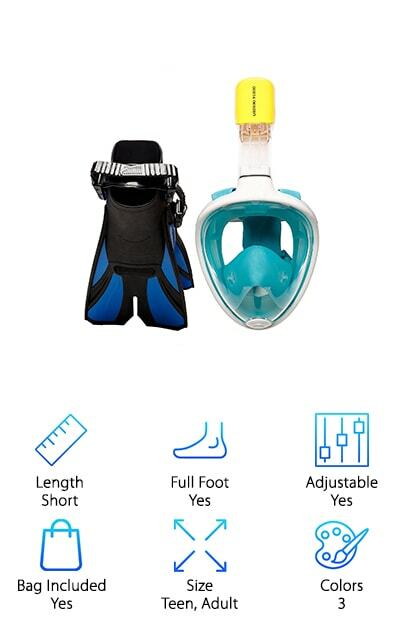 COZIA has a really awesome snorkeling gear set that includes not only a pair short fins but also a full-face snorkel mask. So, you get everything you need to have an amazing snorkeling experience all in this one set. The full-face mask is designed to help you breathe more naturally. Why? Because you can breathe through your mouth and nose like you do naturally instead of only through your mouth, like with traditional snorkel and mask sets. As for the fins, they’re very short which makes it really easy to walk around with them outside of the water. The foot pocket comes with padding but you can remove it if it’s affecting the fit. This set also comes with a mesh carrying bag and is available in 3 different color combinations. 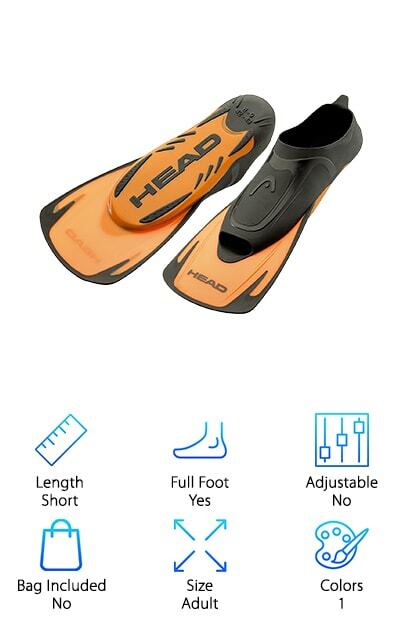 Not only do these fins from HEAD look really awesome, we have to say that we think they’re some of the best swim fins for snorkeling. 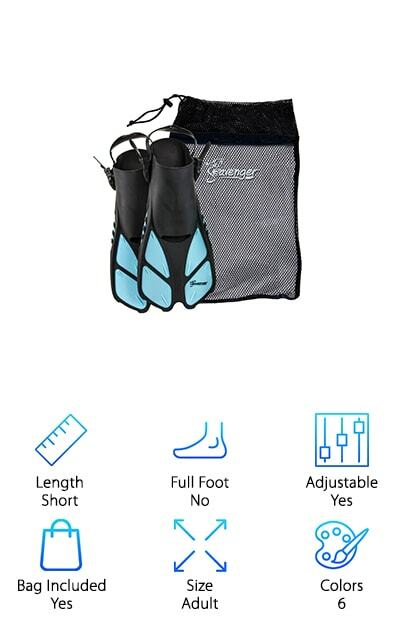 They’re actually designed for water aerobics and swimming so you know they’ll be just right for helping you move through the water when you’re out on your snorkeling adventure. These are a closed pocket fin that fits on your feet snugly but comfortably. As we mentioned, we really liked the look of these fins. They’re black and orange and look very streamlined and comfortable. While they only come in one color, there’s a range of sizes from 3/4 to 11/12. 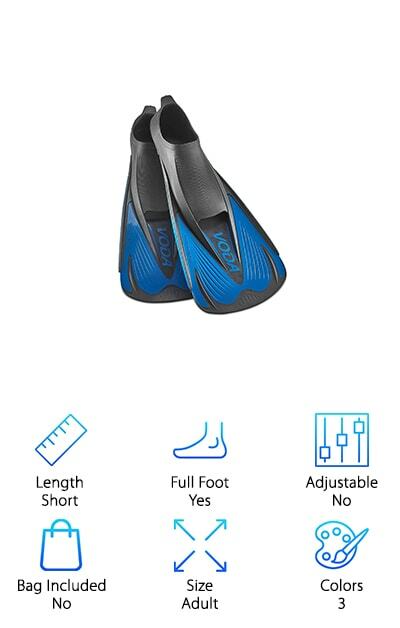 Remember, these fins aren’t adjustable so you’ll need to make sure you get the right size but keep in mind, you want them to be just a little tight. 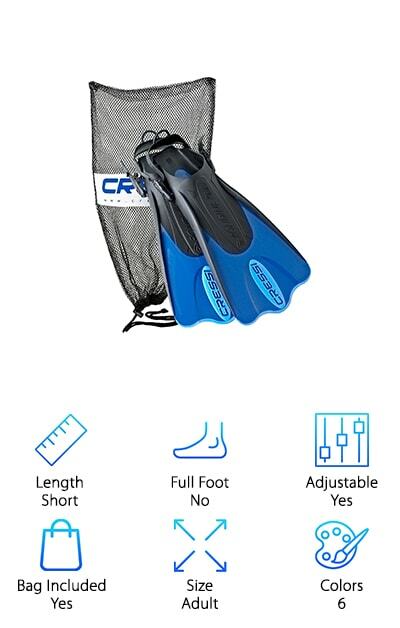 These short fins from Cressi are perfect for snorkeling. We thought these were a special set of find because they’re specially designed to enhance your kick. So, how does it work? Well, one thing is the material of the blades. They’re lightweight, flexible, and highly reactive. They make your kicks more effective but don’t tire out your legs. The design is the second factor. The way that the blade is angled combines with the rails and the foot pocket all contribute to how these fins move through the water. They’re really durable, too, and should last a while and be able to take a bit of abuse. The thing that we liked the most about this pair of fins is the self-adjusting foot pocket. This is something that Cressi designed and it makes for an amazing fit. U.S. Divers makes some top snorkel gear and this kit is no exception. These fins are shorter than diving fins but are a little longer than some of the others that we reviewed. They have a full pocket design and the material is really soft and comfortable to wear. The blades have some venting as well to help them move smoothly through the water. The mask is a traditional face mask with 2 windows, one over each eye. It has a 3-way adjustable strap so you’ll be able to get a nice, tight seal. 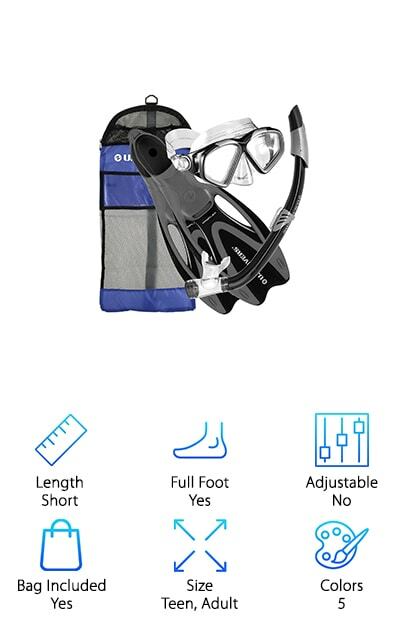 As for the snorkel, it’s a surface snorkel and not made for diving, though it does have a drain in the bottom so any water that gets in can drain out easily. One more thing: you get a nice mesh carry bag. Something unique about these snorkeling fins from Phantom Aquatics is their non-vented design. They’re short bladed and lightweight, ideal for casual snorkeling or even more serious and intense swim training. The blade is really reactive. What do we mean by that? It has side rails and a ribbed design that help focus the water. This helps you get a more powerful stroke. That’s not all. The thermoplastic rubber material helps to make sure that you’re getting the most performance out of your effort. We also really like the foot pocket. It’s soft and comfortable with soft rubber elastomers. Plus, they have an open toe design so these fins fit a range of foot sizes. They also come in a few different color options: all black, black with blue accents, and black with yellow accents. If you would rather wear a pair of long fins to get your snorkel on, take a closer look at the Ivation Diving Fins. 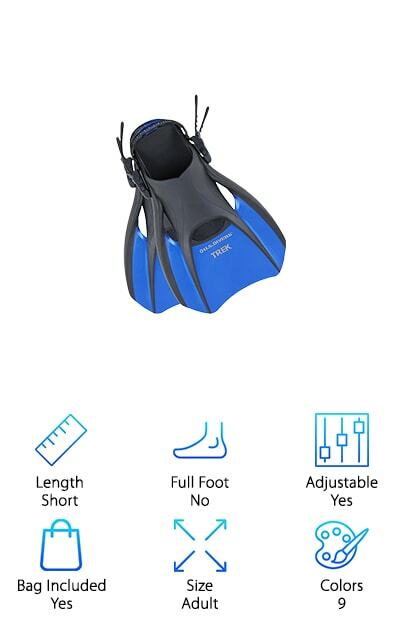 As far as snorkeling fins vs diving fins go, short fins are perfect for snorkeling. But if you were hoping to dive a bit deeper, these are the fins you need. One of the cool things about these fins is the long sole that helps displace the water more effectively. Another thing we really liked is the strap. They’re so easy to use, you can actually get them on with 1 hand. Plus, they’re wider than other straps so they really hold the flipper on your heel without you having to worry about anything slipping. If you like to use swim booties or socks, no problem. The contoured foot opening lets you go barefoot or cover them up.